I think I have a new favorite brand. 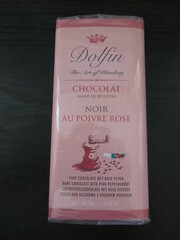 My sister gave me Dolfin's Noir au Poivre Rose (Black with Pink Pepper) for my birthday, and it was the first time I had seen the brand. Sometimes chocolate sits around at home because I have so much, but I prioritized this bar because it was so pretty. There's still a bit of wrapping paper stuck to the package in my picture because I was in such a hurry to eat the bar. The whole experience, from opening the package to finishing the bar, was delightful. The wrapper reminded me of a checkbook (maybe it's a bit overpackaged). The bar itself was wrapped in a liner that reminded me of old-fashioned wallpaper. 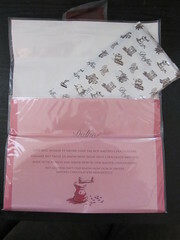 It was so cute and elegant! Oh, the chocolate. It's been a long time since I've enjoyed chocolate this much. 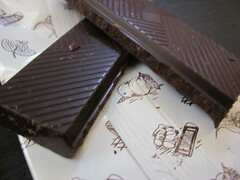 The bar had a strong peppercorn scent that carried over into the flavor. The pepper was more aromatic than spicy, and it was absolutely perfect with the dark chocolate. Speaking of the chocolate, it was some of the best dark chocolate I've ever had. It was nutty and only mildly bitter, with very little fruitiness. The middle notes were sweet and creamy, and the finish was bitter and clean. The pepper even cleared my sinuses a bit, but I didn't find it to be too strong. My husband had one complaint: the slightly gritty texture of the peppercorns reminded him of dirt at times. The texture didn't bother me. After this bar was gone, I promptly ordered more Dolfin chocolate, and, as you'll see in upcoming reviews, I was not disappointed. You know a good review when it makes you want to eat something you think for sure you would otherwise utterly hate. :) Lovely. Wow, I have never come across a blog reviewing snacks before, it's such a good idea! This chocolate does sound amazing, even though I'd have never put the two flavours together!